Now Available, The hassle-free way to enjoy nature’s cooling, slash energy bills & improve your home’s air quality! What’s So Smart About EcoBreeze 2? Everything! Best of all are its health benefits. Its integrated filter traps pollen and bacteria. EcoBreeze 2 is lightweight, low-profile and installs in a snap. By monitoring the daily temperature fluctuations outdoors, it draws precisely enough air into the home at exactly the right time and has been proven to reduce home cooling bills by hundreds of $$$. 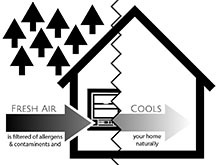 It’s also the first window fan that filters out pollen and dust providing clean and natural cooling. 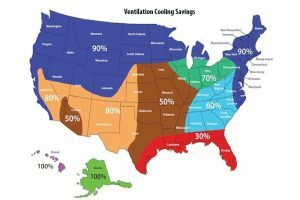 Ventilation Cooling – the inside story We’re a small American Company that dreams about changing summer cooling. How? It’s as easy as making one simple change: use free outside air to cool our homes. It sounds too obvious to be true, but the United States Department of Energy recommends “ventilation cooling” as the most effective way to cool indoor spaces. It’s a technology that’s already required by two-thirds of all commercial buildings in the country, and some of the largest, most powerful data centers on Earth have been taking advantage of it for years. It begs the question: “why aren’t homes using this technology too?” working hard at finding an answer to this question and are excited with our new low cost and convenient way to use nature’s air for cooling. Nature’s Cooling Solution has invested the last 7 years perfecting its patented Smart Fan technology and is proud to introduce EcoBreeze 2. Coming to market in June 2018, it is the world’s smartest window fan! It automatically works in conjunction with air conditioners and maximizes free outside air cooling while minimizing energy consumption. Home air conditioners are some of the most ecologically harmful household appliances we own. In 2017, American cooling devices released an astounding 222 billion tons of carbon dioxide into the atmosphere. But by simply tapping nature’s existing resources, we can save money and slash our carbon emissions – all without sacrificing one degree of our cool, comfy home temperatures. The United State Energy Information Administration’s “Annual Energy Outlook” for 2018 confirms that space cooling is the most costly, electricity-eating aspect of maintaining a home. 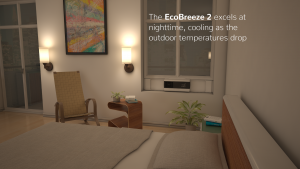 EcoBreeze 2 rethinks the game by relying on one simple fact: cooling our houses with free outdoor air uses 98% less energy than creating it with an air-conditioner. EcoBreeze 2 improves on these savings in two revolutionary two ways. 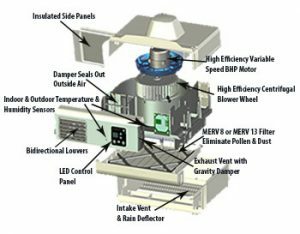 First, its hyper-efficient motor and fan draws 75% less energy than traditional window fans; next, by implementing its patented SmartFan technology that maximizes cooling with outside air and minimizes energy use. We at Nature’s Cooling Solutions are firm believers in brains over brawns. By continuously monitoring indoor and outdoor temperatures, sensing humidity and determining when and how much fresh, free, filtered air to draw into the home at precisely the right time, our EcoBreeze 2 uses about the same energy as an LED light bulb. The entire cooling process is automated, so operating the fan is as easy as setting a thermostat. Simply set your home thermostat to your normal setting, then set EcoBreeze 2’s thermostat to a lower setting. The larger the difference between the two settings the greater the savings. It’s that simple! While potential savings are affected by climate zone, local power rates, and desired temperature, the MINIMUM estimated cooling-related energy savings is 30% with the majority of the United States estimated to save well over 70%. 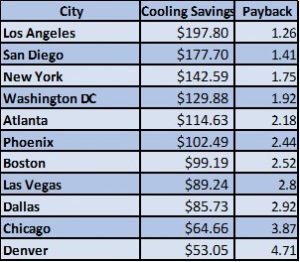 The table shows the potential savings for EcoBreeze 2 over different regions. EcoBreeze 2 Quickly Pays for Itself! EcoBreeze 2 provides such significant energy savings that many units will quickly pay for themselves. Units installed in hot cities like Los Angeles will return their full costs in less than a year. Even colder cities like New York, where air conditioners are used only intermittently, require little over a year to fully return their investments. There are many fringe benefits to owning an EcoBreeze 2, including the fact that it will significantly extend the lifespan of your existing air conditioner. Central air conditioners can cost thousands to replace and hundreds to maintain each year. By reducing how often and how long your existing air conditioner’s compressor runs, it will see an increased lifespan and will last much longer between service calls. Additional Savings – Avoid cooling unoccupied rooms Most single-family homes in the United States have central HVAC systems that condition all rooms at one time. However, many of these rooms are rarely used or go unoccupied for several days at a time. EcoBreeze provides individual room cooling and reduces the cost of cooling unoccupied rooms. EcoBreeze 2 also allows you to focus your cooling efforts on the spaces that you use the most, so the coolest, most comfortable rooms will be the ones you spend the most time in. 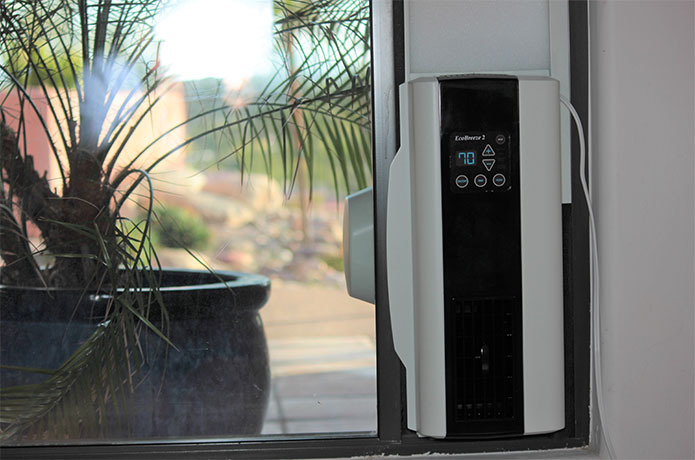 EcoBreeze 2 delivers free, cool, filtered air directly into your home to flush out stale air. But not all filters are created equally. Our optional MERV-13 filter is so fine, so highly engineer that it even traps viruses and bacteria. Smog, smoke and dust will be eliminated from you living space, allowing you to relax in the freshest, coolest, healthiest air your home has ever known. 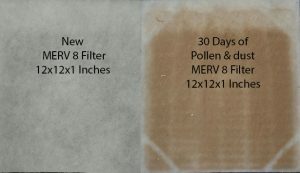 Our standard MERV 8 filter does a great job at removing pollen, dust mites and mold spore providing clean fresh cooling. Th e answer lies in our comfort zone. When we get too hot our bodies start to perspire so we turn on our air conditioner temperature to avoid this zone. When we get too cold we reach for sweaters or blankets. The difference between these temperatures is known as our comfort zone. When EcoBreeze 2 and air conditioning are used together they have different functions. The AC’s job is to avoid entering the TOO WARM zone. The job of EcoBreeze 2 is to maximize the use of outside air to lower the room temperature to just above the TOO COLD zone. In practice it’s really simple. Set the ac temperature toward the high end of your comfort level. 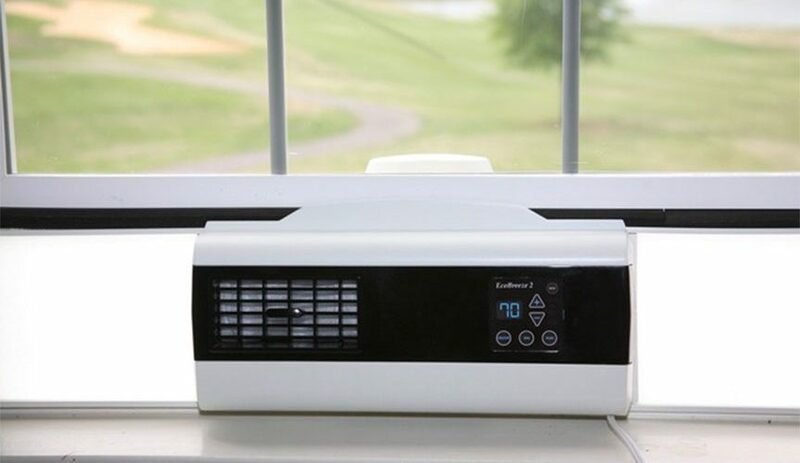 Set the EcoBreeze 2 temperature at the low end of the comfort level. When there is cool air outside the EcoBreeze 2 SmartFan technology will automatically take over to efficiently lower the room temperature. When the outdoor air is too hot or humid the ac will kick on to avoid the TOO WARM zone. WARNING! This could create a new thermostat war! Increasing the difference between the two set points will increase savings. Everyone will have to agree on the comfort zone or you can just do a stealth adjustment to have it your way! Less energy means less waste. 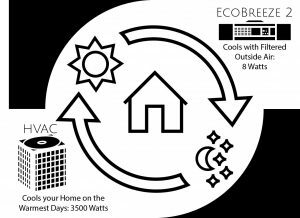 Since the EcoBreeze 2 can potentially reduce your home cooling energy usage by an outstanding 90%, your carbon footprint will reduce linearly. And if your air conditioner is running less frequently, the noisy, industrial fans attached to them will no longer be a bother to you and your neighbors.